I have been invited to create a work that responds to a Nicols Goddard early 19th century clock in the Bennington Museum Collection. This work will be exhibited in a group show titled "Time for the Holidays" and is for sale, a silent auction and fundraiser for the Museum. For this set of drawings I hammered a gear similar in age and form to a component in the Nichols Goddard Clock. I placed the gear in the center of each square of paper (with graphite transfer paper in between) and struck the gear repeatedly. Each time I hit the gear with the hammer it moved. I used time as a parameter for the work; viewing these series in a clockwise direction from the upper right quadrant drawings were made in 15, 30, 45 and 60 second intervals. These time frames reference the markings on the face of the Nichols Goddard clock. While this work is silent and static as displayed, the process of making the drawings encompasses sound and movement, resonating with like qualities of the Goddard clock as it works to keep time. Thanks to Sabrina Lorah I have a beautiful new site! Just heard that I've received a residency fellowship to go to Yaddo for three weeks January 21st -Feb 10 2015. YES! I'll be focusing on my drawings and prints. The exhibit as opened, the installation is complete! 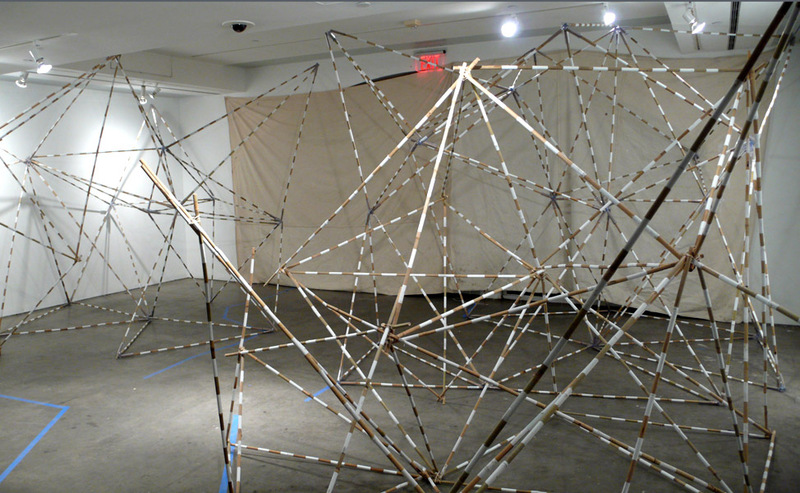 here is an image of "Drawn Out", 10' X 13' X 7', Ribbon, Lead, Carabiners and Steel, 2013. Three lead weights create a tensile force on the horizontally woven ribbons; this force helps to shape the main volume of the piece. The counterweights are connected to the main form by satin ribbons strung through a series of carabiners, mounted on the ceiling and the wall, that redirect the tensile force created by the lead weights. Jeff Bergman, Associate Director at Pace Prints curated the show "Flat/Not Flat" for which I created this work. The work of Jennifer Davies, Karen Dow, and Martha Lewis is also on exhibit here and it is all well worth seeing. Artspace has some funky hours over the holidays - Artspace is open Wednesdays & Thursday from 12-6pm, Fridays & Saturdays from 12-8pm. The gallery is free and open to the public. Artspace will be closed for Thanksgiving November 27-30th and between December 18th and January 7th." Curator Jeff Bergman wrote this on his blog "Atlas". "Alisa Dworsky built something quite remarkable with Drawn Out. It conforms to the space without overtaking it, but makes a huge impact. For me, the piece becomes a one quarter slice of the axis of the planet. The architecture of our world. Dworsky and I were able to discuss materials, spaces and methods, but nothing could have prepared me for the physical reality of the piece. 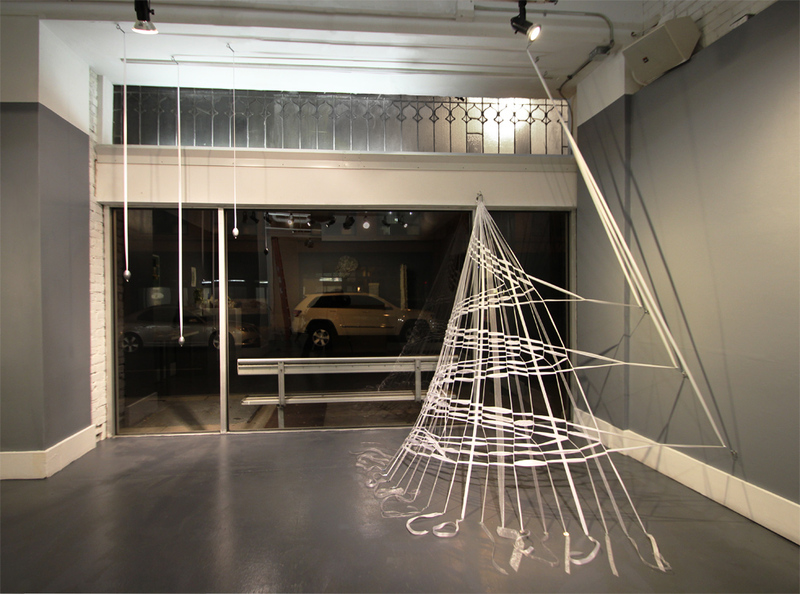 Alisa took ribbon, hardware and weights and made a space born of physics and air. Her drawings quite literally flatten the piece using ribbon and graphite. The erasures and the grissale line fills me with the joy that usually only Celmins and Ruscha can." These are some early models and full scale studies for a piece I am developing for the brattleboro Museum. Dancers will perform parts of the installation. This installation was created for the lexington Art league, a contemporary art space in Lexington Kentucky. 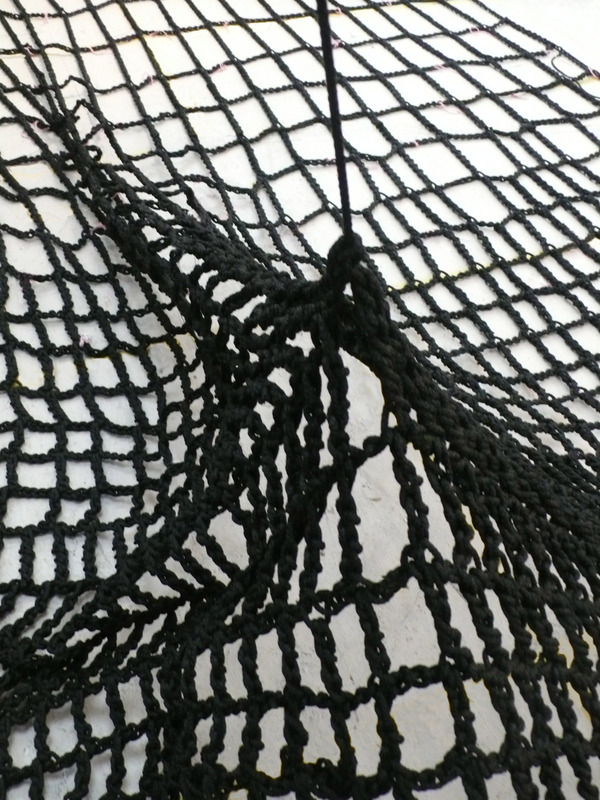 The work is made of rip stop nylon, dowles and custom connectors and is sited in a 20' X 30' X 15' room. Many thanks to the staff and volunteers at LAL for their support of this project. 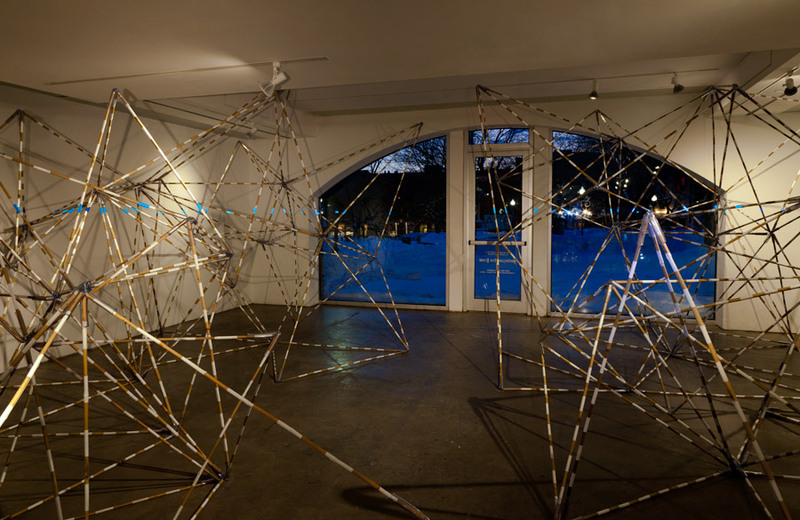 This installation is made from a series of tetrahedrons, ideal solids made of 4 connected triangular planes. 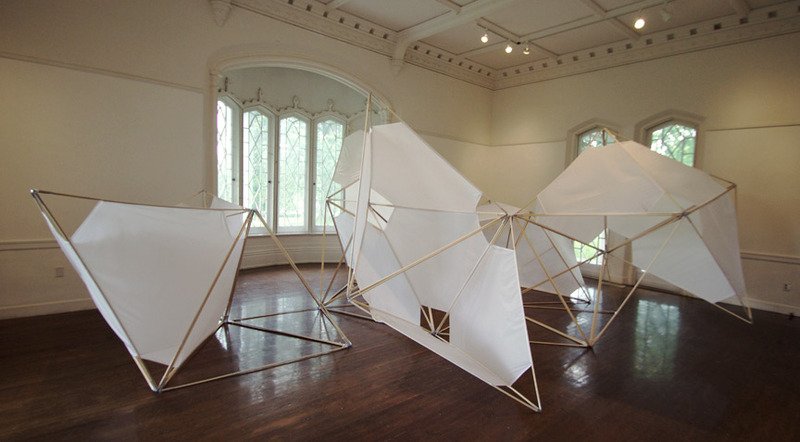 Inspired by tent and kite construction, the tetrahedrons are made of dowels and tensile fabric panels assembled with light weight connectors. I am interested in how the repetition of a single shape, varied in its enclosure and orientation, assembled creates a crystalline landscape. The experience of this landscape changes as one moves around the piece. 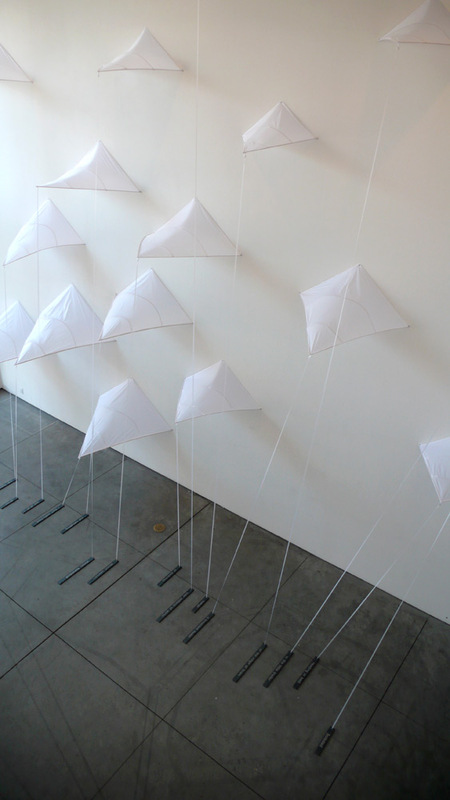 I selected white fabric for the installation because I want to emphasize the shade and projected shadows in the work. The white panels also reflect the subtle color shifts that take place as the light changes over a day. The triangle and the tetrahedron are remarkably efficient and strong forms…. forms that are the basis of the visionary work of the engineer and designer Buckminster Fuller whose work influences this piece. I am interested in how one can build light forms that compact and ship efficiently and yet deploy to activate and define a space by expanding when assembled. These are process images of the installation- full size material studies and models. final Materials for the project are 5' long 1/2" diameter dowels, rip stop nylon, tubing, hardware.The final installation will be in a 20' X 30' room with 14' high cielings. 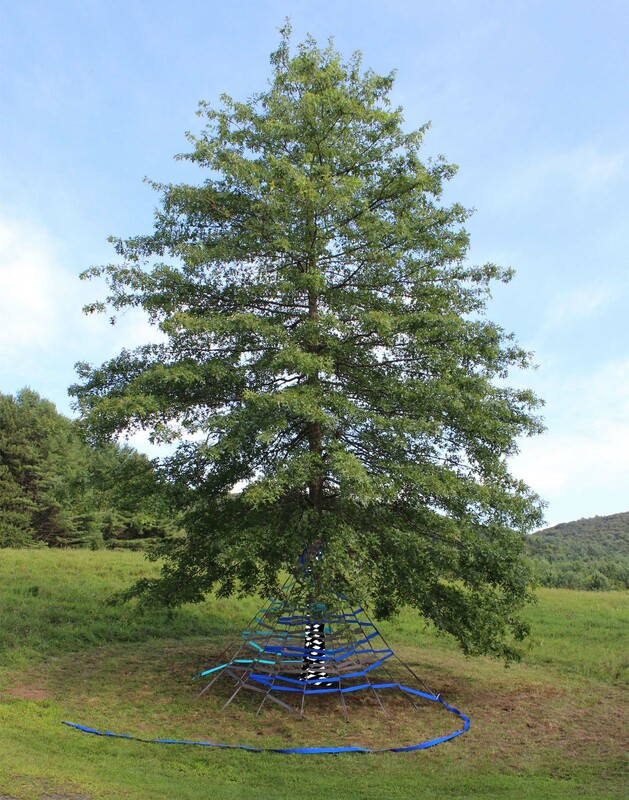 This work engages a community of people to weave strands of ribbon around trees or poles to make a series of large-scale textile installations. 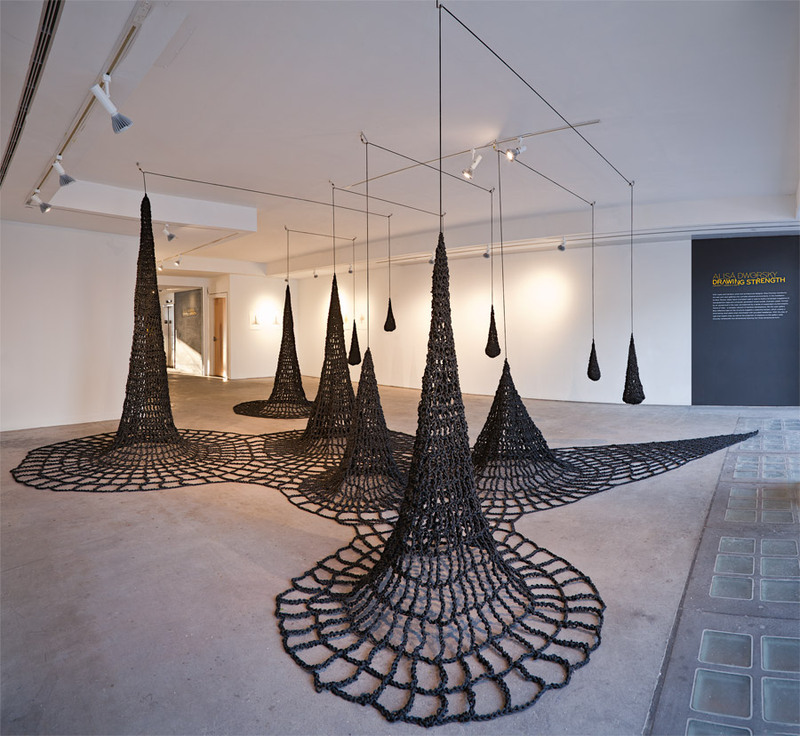 Expanding and radically transforming the concept of the maypole dance, this work builds on my installations made of hand- crocheted rope and adds the potential for choreographed movement. This piece is both a performance and a work of visual art. My goal is to create striking tapered forms with varying graphic patterns. I want to make these works in series so it is important that I can vary the weaving technique to create a range of formal qualities. I intend to create a number of works for different venues. Hurray! 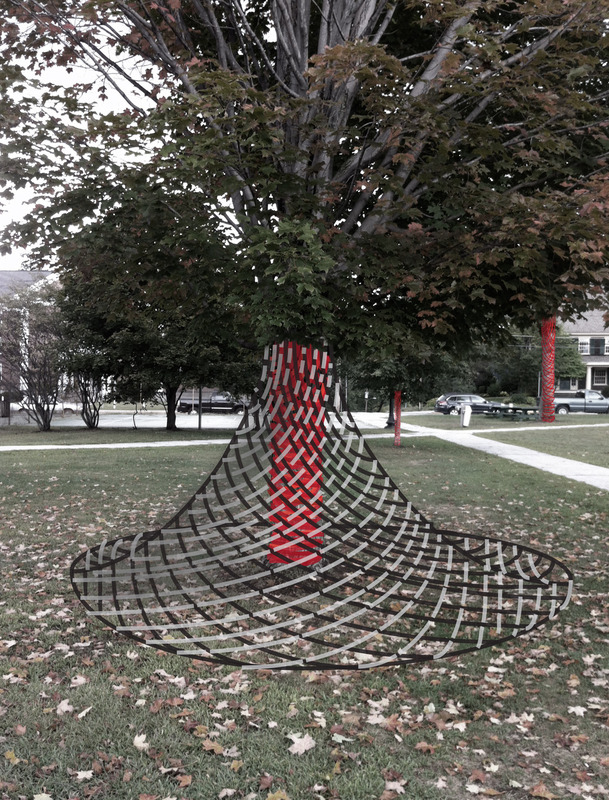 I am thrilled to have support from the Vermont arts council for an innovative installation I am developing. This installation radically transforms the concept of the maypole dance...a group of people use a movement system to perform/construct a series of large outdoor textile installations. The Brattleboro Museum will present the work -likely in spring 2014.
here is a design/sketch (very rough) of what one such construction might look like. "Soledad" Installation Completed! show opens May 26th at 516 Arts in Albuquerque. Below some early images of the installation process and of the finished installation. See previous post for the text of Miriam Sagan's poem which is incised on the steel plates seen on the floor. 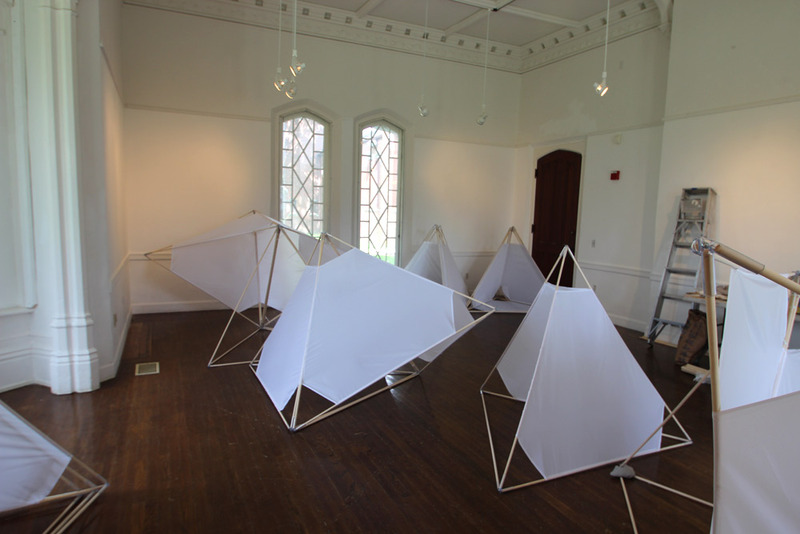 Soledad is one of 2 installations based on poems by Miriam Sagan in the exhibit "Time Pieces: Wendover Landing". The exhibit remains up through August 11, 2012. Soledad is made of ripstop nylon, wood dowels, ribbon and steel. The images presented below include studio shots taken during fabrication and a photoshop image of the installation as it will look in the gallery. I will install the work in the week between May 21st and may 26th. I plan to attend the opening so say hello if you happen to be there. I created the installation “Soledad” in direct response to the poem by Miriam Sagan. I read Sagan’s poem looking for imagery, dualities, and contrasts in the text that could guide my search for a visual approach to the installation. I noticed the expanding scale in the poem – text, bed, trailer, town, millions of acres, Venus, all of desire- and I expressed this idea with the chevron form of the wall pieces and their enlarging size as they are distributed across the wall. I noticed the transition in Sagan’s imagery from darkness towards light and from the earthly realm of human enclosure and habitation towards allusions to the celestial and distant time. The presence of a text -implied by the phrase “reading in bed”- occupies in the poem the grounded real of human settlement as the reader is nested within the bed, trailer, and town. I have therefore incised the text of the poem on dark steel bars – a material that has weight and that is associated with buildings. The white fabric wall forms suggest the celestial realm, the coming of day and the imagined waves of the “primordial sea”. These stretched fabric forms blend into the white of the gallery wall, a wall that can be understood as a metaphor for the infinite space and potential of the creative imagination, which includes for me “everything I don’t understand” and “all of desire”. The fabrics forms are pulled taught and are anchored to the floor by ribbons that connect them to the steel bars. As there is a functional and formal connection between the grounded steel text elements and the floating light forms of the fabric, so too I imagine delicate threads connecting the reader to their thoughts of celestial bodies, the coming of day, primordial times, their emotions and their imagination. 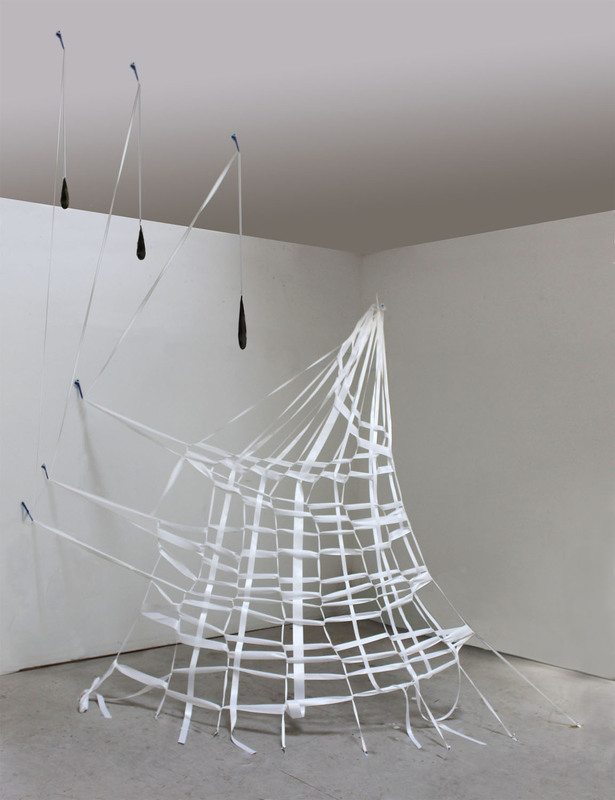 I approached the fabrication of the installation by using materials and methods that were new to me. 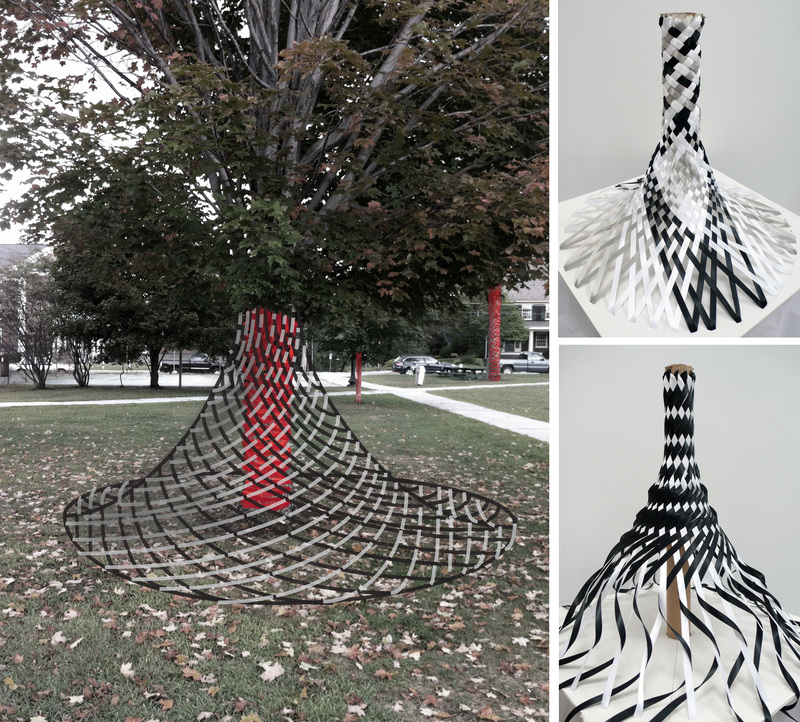 This installation is made of rip-stop nylon, birch dowels, grommets, ribbon and steel. The chevron forms are very lightweight tensile structures influenced by tent and kite construction. The constraints presented by “Soledad” - the distance of Albuquerque from my studio in Vermont, the limited shipping budget, limited time on site to install and the limited loads that the gallery ceiling could support- pushed me to make an installation that is lightweight, collapses for shipping and can be deployed relatively quickly. Because of my experience in architecture, I think about how fabrication and construction influence form and how the constraints of a project - site, budget, shipping, logistics, time, available labor - can serve to inspire and stir up a creative process rather than undermine it. 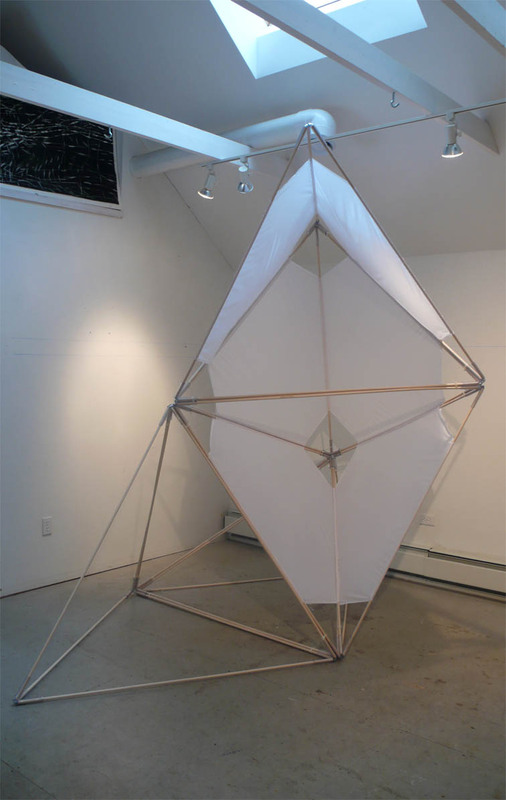 These images are of two recent installations of mine created for a solo show in Burlington Vermont that was in place January and February of 2011. Ken Burris did a terrific job of photographing these two room size installations. 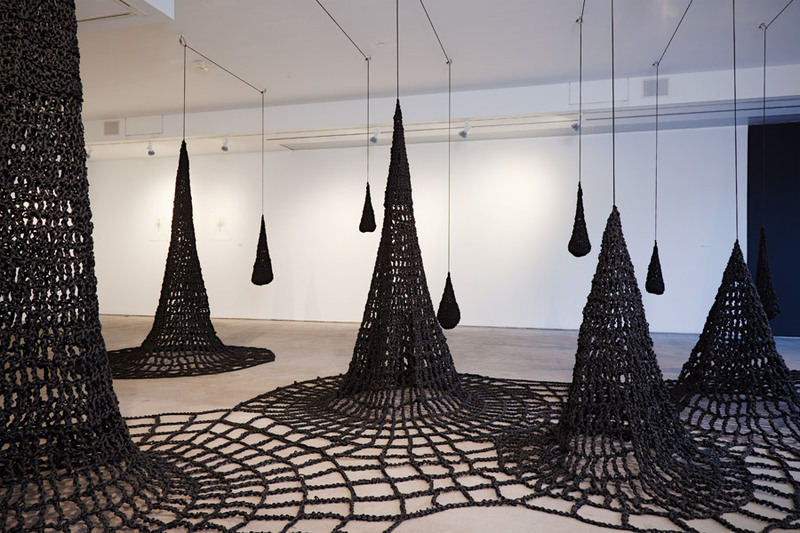 The black crocheted piece is called “Surface Tension” and is made of over 20,000 ft of hand crocheted black rope. 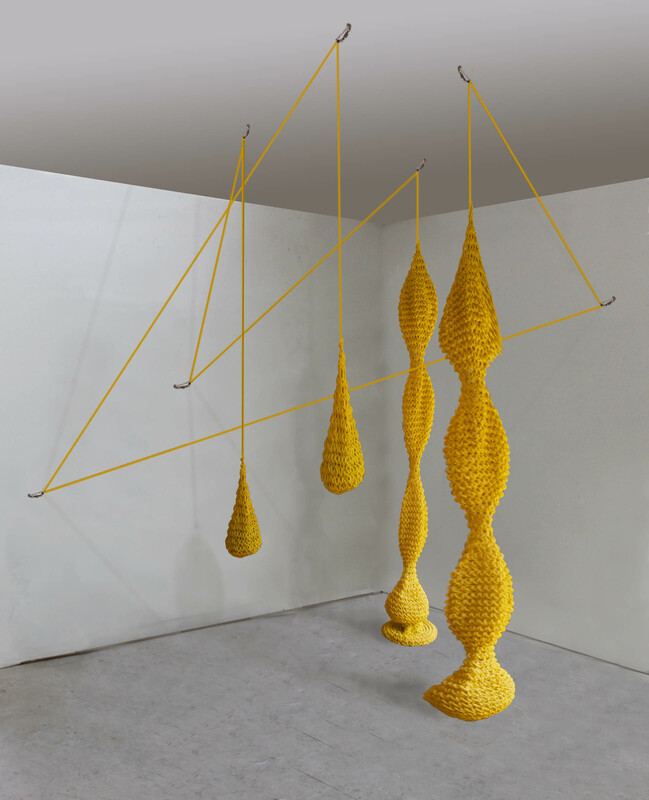 The conical forms are supported via a counterweight system, crocheted sacks loaded with river stones. The room in which this piece is sited is approximately 26′ X 36′ X 10′ . 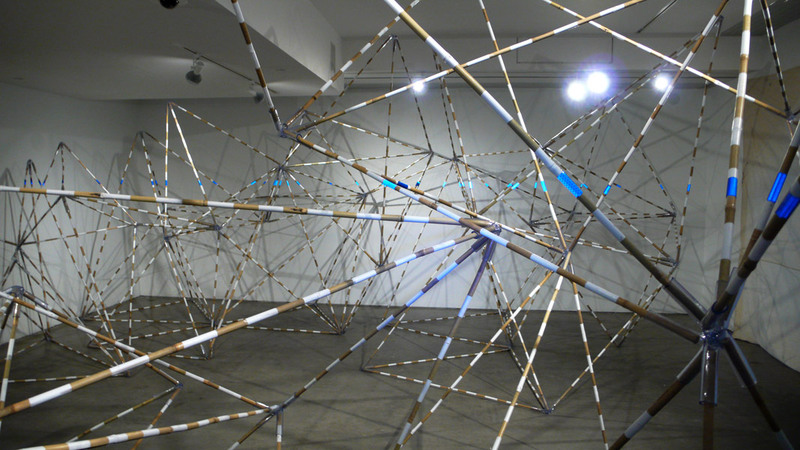 The Bamboo and reflective tape artwork is titled “Points of View”. Blue reflective tape was mounted at level on a scaffold of bamboo tetrahedrons. This work alludes to the way water finds its own level and to our human tendency to impose order on a landscape. Visitors to this installation were given headlamps with which to view the work. 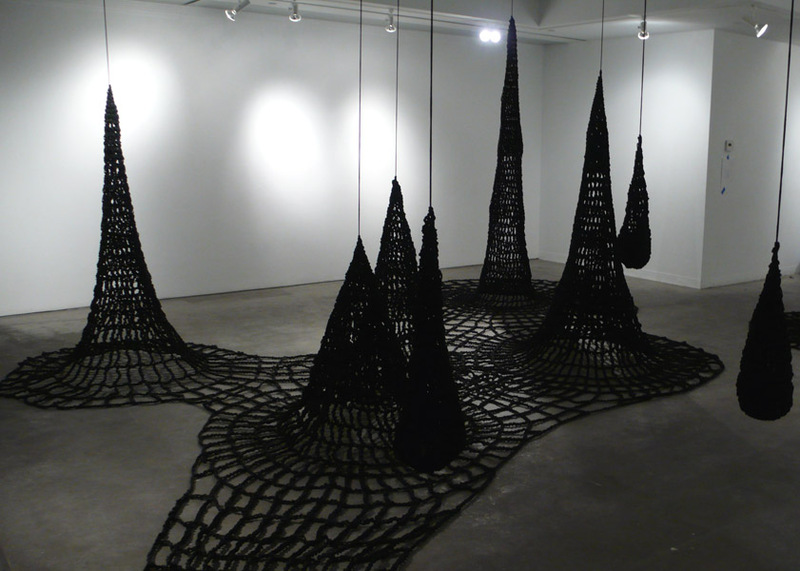 One of My suspended crocheted sculptures "Taper with Counterweight" , will be in an upcoming show from Feb 9 to March 5 at Gallerie Maison Kasini in the Belgo Building, #408 372 Ste. Catherine West , Montreal, Quebec 514-448-4723 . The opening Reception is Saturday February 12th from 3-5 pm. This exhibition is curated by Ric Kasini Kadour. See link at right of page to Gallerie Maison Kasini. I'm done! Just finished up yesterday afternoon. We added reflective tape to posts and trees in city hall park, extending the "shimmering blue waterline" in my installation "Points of View" out into the great landscape beyond the gallery walls. The lighting and final labeling of the show will be completed by the Gallery staff this week. Keep in mind that the photos posted here are quick shots taken by me at the end of a long day without finished lighting. I include below the content of a review of my work written by my friend Andy Sichel, artist and a former professor of art at Rutger's University.He very generously surprised me with this a couple of days ago, sending his remarks out via e-mail to his community. I have watched my brilliant friend Alisa's work as a sculptor and draftswoman evolve and mature over more than a decade now and I wanted to share this with you all. Her work is informed by her feminist consciousness, her "day jobs" as a Yale trained architect, teacher at Norwich University (VT) and as the mother of two quickly growing children. Alisa's work melds a thorough and considered understanding of art history with the tenacity of sticking with an initially wise and equally considered choice of "art parents" whom I see as extending from Shamanism through the Artisanal and site specific works of the middle ages, the Utopian visionary, architecturally schooled sculptors and painters of the High Renaissance and Mannerist periods into Dada and Surrealism, the Bio-morphism of Archile Gorky/ Abstract Impressionism, early Modernist architecture (and Meret Oppenheim) ,and the obvious continuing thread of her visually acknowledged Feminist and late Modernist "mother" Eva Hesse, whose mere five year tragically abbreviated career staked fervent ground for many lesser and some (older) peer women sculptors like Jacquie Windsor whose work because of its materials and apparent lack of feminist content is sometimes seen as at odds with more avowedly feminist work like Judy Chicago's Dinner Party. However as women artists continue to be hugely under-represented it seems to me that any woman artist who manages to be seen and acknowledged becomes "Feminist" by virtue of being available as a model of a still marginalized minority. 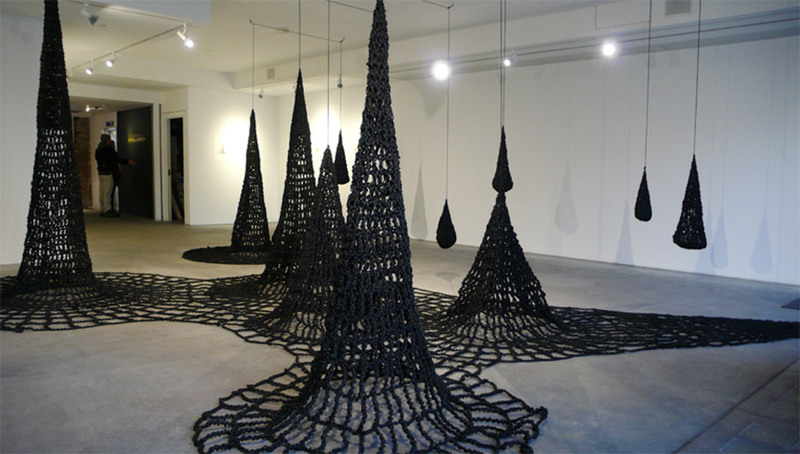 Dworsky's crocheted rope sculptures are certainly per se more avowedly feminist than Louise Bopurgeois' or Alice Aycock's work yet their process and scale share the more traditionally "male" muscularity of these more celebrated women artists. Alisa's sculpture has in the past decade spoken to art's role in relation to architecture and/or environment and I'm particularly impressed with the maturation of the crucial component of a cognitive and affective personal visual/conceptual vocabulary in her work. This is what elevates innovative good art, which nominally contributes to the ongoing contemporary art/philosophy discourse (which is sometimes a lot of noise) to art which whilst doing that, echoes above the clamor to a sustained intriguing and ultimately mysterious conversation which is not happening with the intent of an elitist mystification but which invites us in, as with Joseph Cornell's work, and transcends the nuts and bolts de rigeur covered bases to, with luck, become part of the larger enduring historical discourse. Best to you and Brava Alisa! The installation of my solo show at BCA is almost complete! 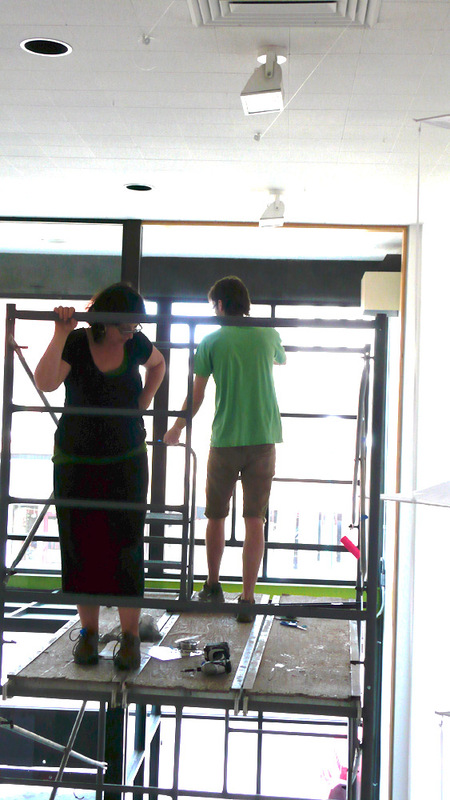 I'm exausted but pleased with how the onsite installation phase of my show at the Burlington City Arts is going. "Surface Tension" went up in a day and half. Meanwhile I've been working with 2-4 assistants at a time to construct "Points of View. The images posted here are rough, no great lighting, still work to do but they will give you a sense of how everything is developing. Remember the opening reception is friday January 14, 5-8 pm. The doors to the show open january 7th at 5 pm. Click the BCA center link to the right for more info on the location and gallery. See earlier postings about this show for more info. I start installing two new installations and a suite of new prints on January 2nd for my upcoing solo show at the BCA Center ( formerly the Firehouse Gallery), 135 Church street, Burlington VT. See my earlier posts to view these works in progress. " 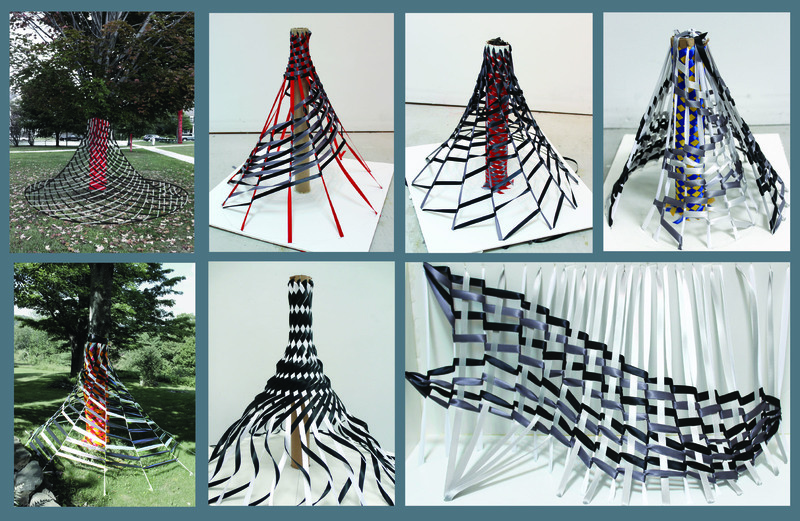 In the exhibit “Drawing Strength”, artist and architectural designer, Alisa Dworsky, presents prints and installations. 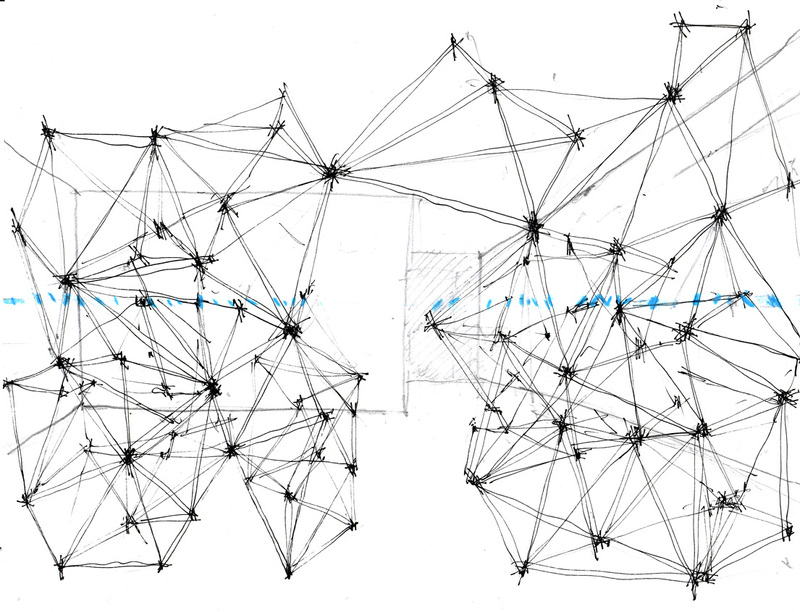 Drawing is at the basis of all the work presented here including the installations. 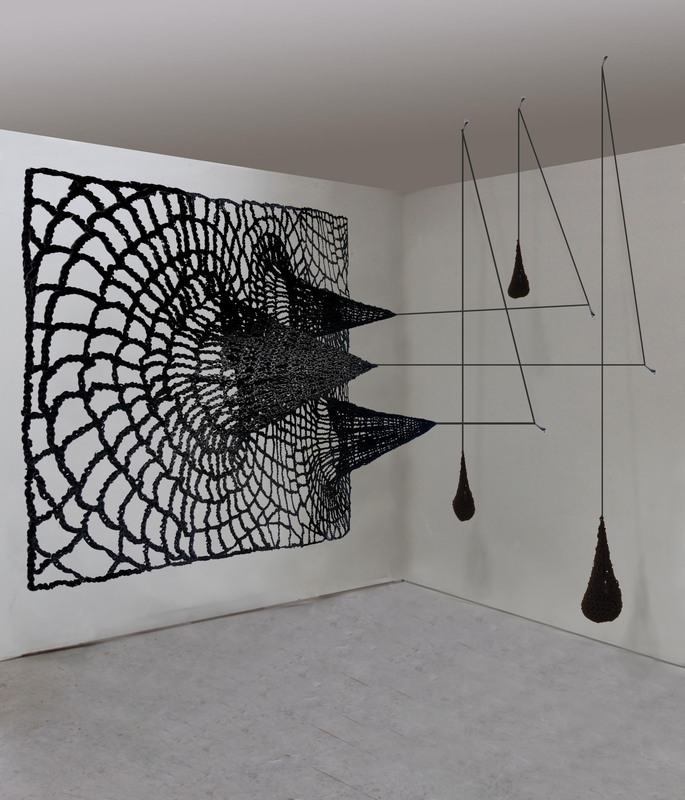 Dworsky intentionally selects linear materials ( here rope and bamboo) for her constructions, materials she manipulates to express drawing in three dimensions while defining space and form. The artist continues her investigation into the ways that human beings interact with the landscape, particularly our compulsion to impose geometric systems on the spaces we occupy. She presents prosaic materials in unusual ways, draws inspiration from architecture and construction, and provokes the viewer to reexamine the way they see their everyday world. Dworsky uses her art to explore the ambiguity of perception." The opening reception will be Friday January 14th from 5-8 pm. I'll give an informal artist's talk at 5 pm that night. Stop by if you are in the area. I will also try to be around for the Friday January 7th soft opening during friday night art walk in Burlington. The title of my show alludes to the influence of drawing on this new body of work ( even though there are no drawings in this show) and the title alludes to the efficient systems of structural support used in these pieces. All the time I've spent building and designing structures has inevitably had an impact on my art. I consider these new installations a continuation of my "landscape" works . Instead of responding to a landscape outdoors, I am building a couple of landscapes within the Gallery walls. The installations evolved from my continuing interest in the human tendency to overlay the landscape with geometric systems in an effort to impose order . I enjoy the "Middle Ground" that Leo Marx speaks of in his great book, The Machine in the Garden. This middle ground moment occurs when culture and nature exert an equal force on a place , each shaping the other in an aesthetic of coexistence which Marx speaks of as the true definition of the pastoral. 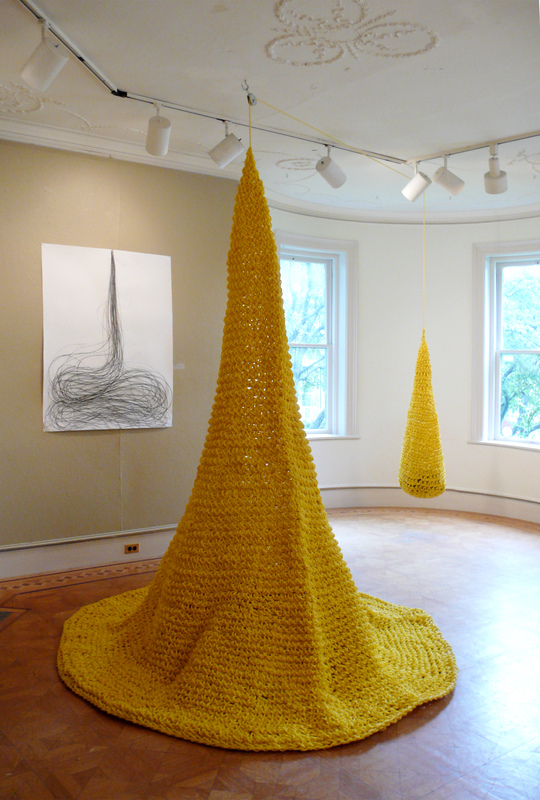 I've been crocheting in the past few weeks as I prepare "Surface Tension" for the front Gallery on Church Street. There will be a counterweight system supporting it and I have work to do connecting the elements with more crochet at the floor level. It's coming along. I'm using a "Fillet Crochet " technique to make a cellular pattern. I vary the size of the 'cell" creating subtle tonal shifts in the work. I like this approach because the piece is so graphic, the line quality so evident with this play of positive and negative space at my disposal. I could almost write binary code with this technique. Of course the open cells and radiating lines and grids also remind me of computer drawings. The handmade and the digital all wrapped up . I do use computer graphics as well as hand drawing to rough out the shapes and general approach to the installation. Also in the slide show are a few details of the second installation which will be in the show titled " Points of View". 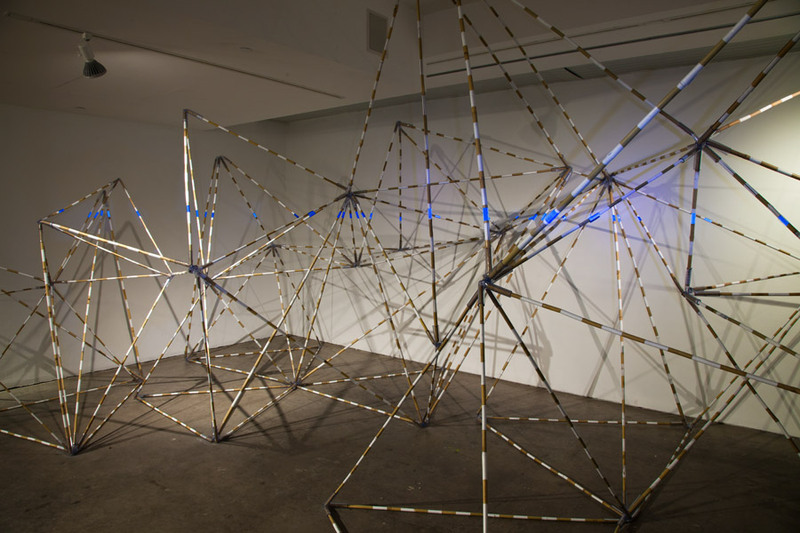 This work is made of poles configured in a web of tetrahedrons on which reflective blue tape is mounted in fragments at a level, creating a tenuous shimmering plane . The hidden order within this "landscape" is only visible from a certain point of view. Thank you to the Vermont Community Foundation, Arts Endowment Fund for the grant which supported the creation of this new work. I am creating 2 new installations for this upcoming show at the Firehouse Gallery, opening friday January 14, 2011. I Consider both installatiosn to be three dimensional drawings. Each piece presents an ambiguity and play between the two dimensional and three dimensional realms. The images shown below are schematic drawings and studies which I have done in preparation for creating the final works. 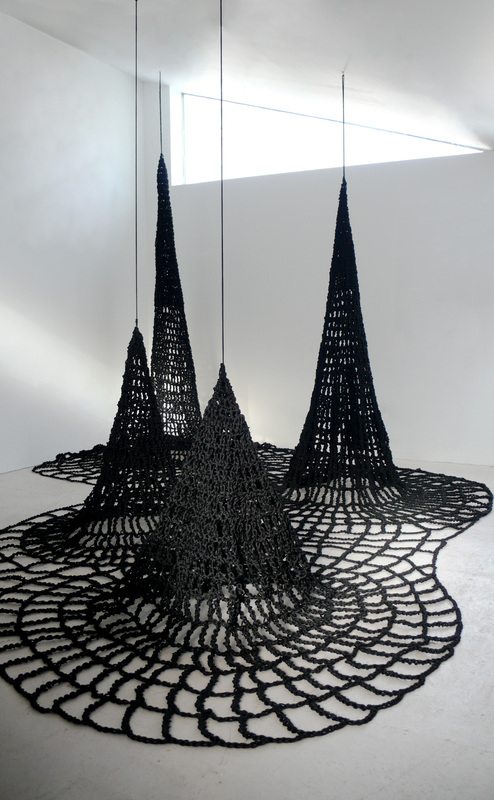 The first installation titled " Surface Tension" will be made of over 18,000 ft of hand crocheted polyester rope. 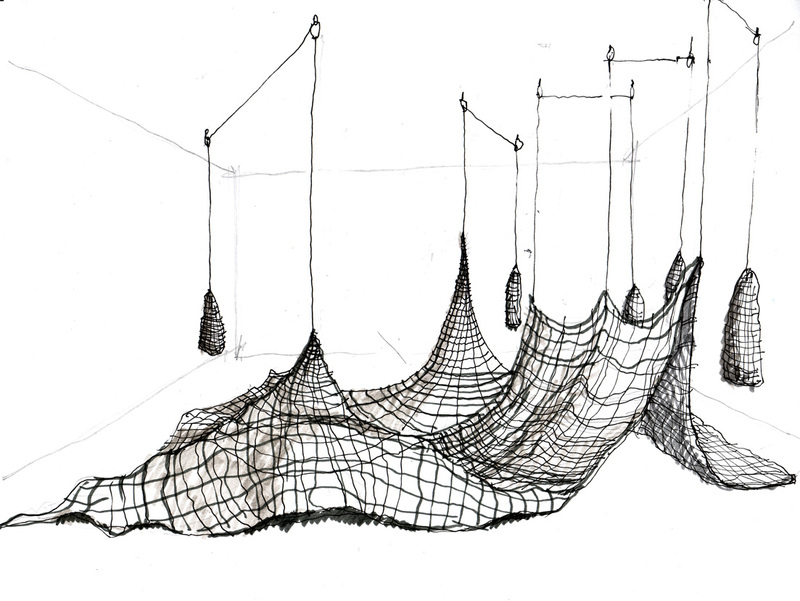 A series of counterweights, crochted sacks filled with river stones, are connected to the piece with a rope and pulley system, thereby raising the work off the floor to create a topographical surface. 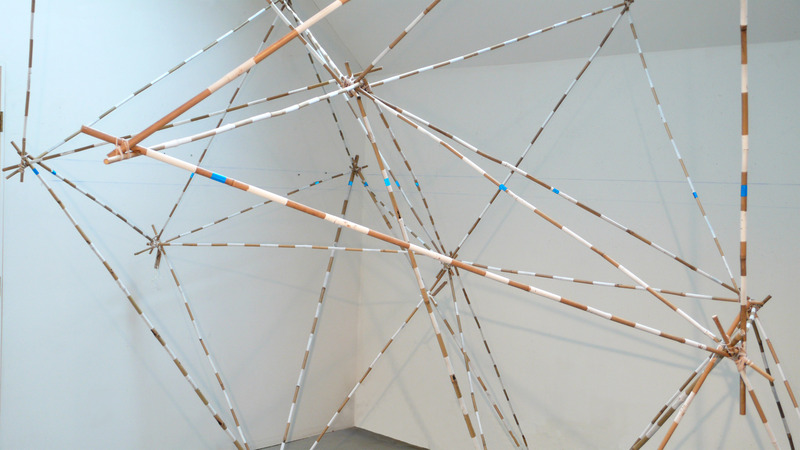 The second installation, " Points of View" is made of a series of poles (painted with white stripes) that are connected to each other to create a matrix of tetrahedrons that will fill the gallery space . With the use of a water level, pieces of blue reflective tape are mounted on this armature at level. A horizontal datum is established at approximately 5 feet above grade. When viewed from below or above no particular order will be apparent as to how this tape is positioned yet at a certain view point a level line within this interior landscape will be revealed to the viewer. The work will be lit by the viewer them-self, wearing a headlamp. The viewer with headlamp will activate a glow in the reflective tape while someone standing beside them will not see this phenomenon as their line of sight will not exactly correspond to the trajectory of the lighting source. ”Job Site”, an installation created with Bill Ferehawk. We examine the beauty and movement embedded in wood frame construction and its processes. This work integrates works on paper, fabric, wood frame construction and video and will be exhibited at Burlington City Arts June 21 - October 6 2019. My Table Acerframe, created in collaboration with Danny Sagan, was recently on exhibit at the Bennington Museum, Bennington, Vermont, in the exhibit Peace Love Harmony: 1960's Vermont. November and December, 2018. 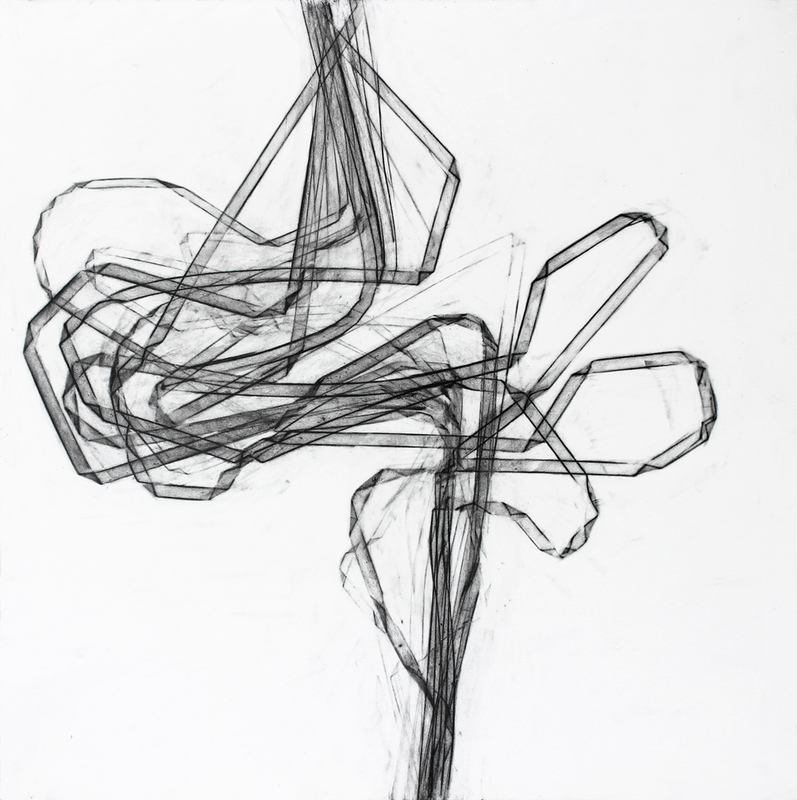 My drawings from the Fold Series were on exhibit at the Vermont Arts Council: Spotlight gallery through December 2019 . In the exhibit Seven women, seven Walls. My drawings were in the Main Street Museum 25th anniversary show opening December 8, 2017 through April 2018 . White River Junction, Vermont. My recent solo exhibit , February 3- March 17, 2018 included drawings and installation, at Cynthia Reeves Gallery on the MASS MOCA campus, North Adams, MA .